Looks like HTC One mini is ready to follow the footsteps of its big brother – HTC One. 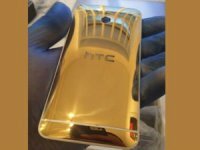 Following the gold edition of HTC One, now the gold version of the One mini has appeared in a set of photographs leaked today. These images shows a 24-carat gold edition of HTC One mini, which is reportedly being made by a third-party jeweler. As this is not coming from HTC directly, the company won’t be selling it officially. The gold version of HTC One mini will be joining the HTC One gold edition by Gold Genie, which is currently on pre-order for £1,895 ($3,015).